Mix it up with this cool mobile cafeteria booth system. 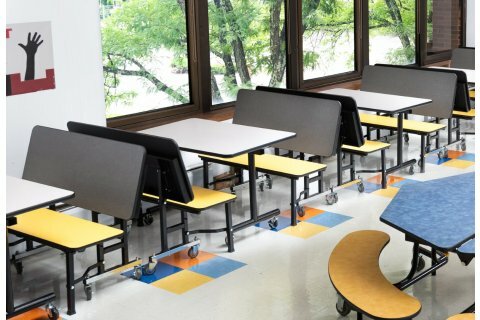 No matter what combination of pieces you choose, these booths and tables are the flexible, functional choice. Locking, double ball-bearing casters, and an industrial-grade folding mechanism, make this collection incredibly easy to move and store. Setting up your booths and tables is just as easy. Once they have been steered into position, they easily open with the pull of a handle. Choose from tables and booth benches in a selection of sizes, as well as convenient sets, and a choice of MDF or particleboard core, to get the ideal fit for your space and budget.